We don’t usually think about corn when it comes to dips, but it really is the perfect ingredient. The sweet corn lends itself perfectly to all the cheeses and other veggies, so you get a delicious depth of flavor with literal pops of sweetness scattered throughout. Sweet and creamy, with the perfect amount of spice, this dip is our new go-to; we use frozen corn in the cooler months, but once summer rolls around you can bet we’ll be shucking fresh corn for an even better dip that will blow you away! Melt butter in a large pan or skillet over medium-high heat and sauté onion and bell pepper for 5-7 minutes, or until softened. Add corn and cook for another 5 minutes, stirring frequently, until golden brown. Season generously with salt and pepper, then sprinkle in cayenne, if using. Stir together and add minced jalapeño and garlic. Cook for 1 minute, or until fragrant. In a large bowl, mix together mayonnaise, sour cream, 1/2 cup cheddar cheese and monterey jack. Fold in sautéed vegetables, then transfer mixture to a 8-inch baking dish (or pie dish). Top with remaining cheddar cheese. Place in oven and bake for 15 minutes, or until cheese is melted and bubbly and just beginning to brown. 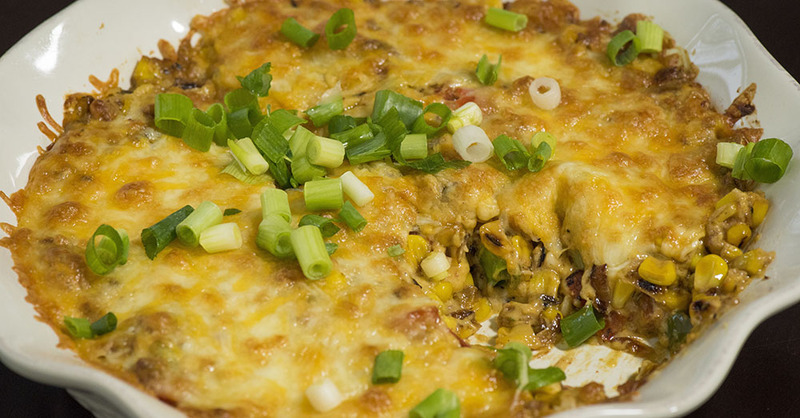 Remove from oven and serve with tortilla chips or fresh veggies. Enjoy!